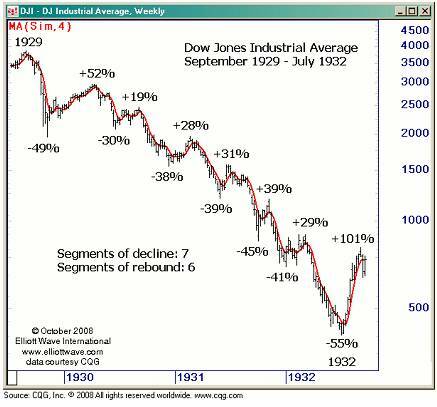 As we stated last October (the month of the stock market’s peak); “the stock market is a sideshow, it can adjust to the economic reality very quickly as it did in 1929 (especially with credit losses already in place).” Only misconceptions about the Great Depression cause a dismissal of the similarities. Commodities are correcting sharply as forecast. The U.S. Dollar has gained double-digits against other currencies while the Yen is “soaring to 13 year highs.” The U.S. stock market (DJIA) has fallen below the ‘line in the sand’ described in March. And European countries are faring much worse as expected. Even our forecast for Mega Thrift is becoming more plausible. 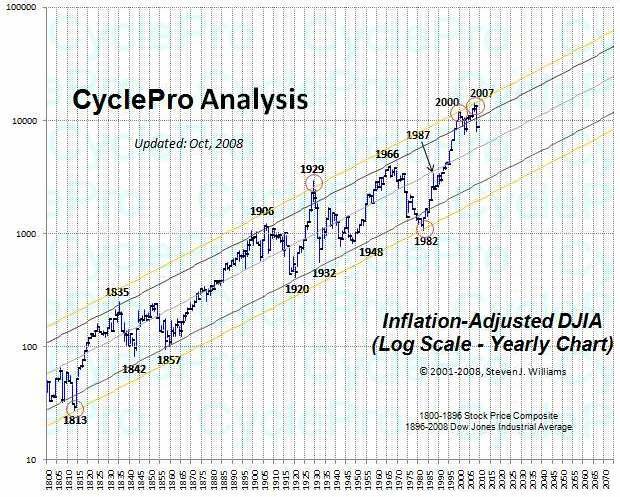 As mentioned in April of 2007, “When the effects of inflation have been extracted, the DJIA is much more cyclical than Wall Street promoters would care to admit.” Steve Williams of Cycle Pro has updated his inflation-adjusted Dow Jones Industrial Average chart (below) which we previously cited. The recent sell off seems insignificant when viewed over the last 200 years. Our target is unchanged; we expect the market to swing to the lower end of the trend channel. On the way to the bottom, the market must relieve bearish sentiment (make you forget your fear). It can only do this through sharp powerful rallies (where we all laugh for a day with CNBC on how close we came to the brink). We have described these as “rocket-launched (oh they’ve saved us) bear market rallies.” Investors who cheer these sharp up moves as a sign of the bottom should take note of the chart provided by Tom Denham from Elliotwave.com below. TIPS are signaling negative inflation for the next 5 years and inflation below 1% for the next 10 years! Therefore we would like to reiterate our call to investors to preserve their portfolios with U.S. Treasury Bills (interest bearing cash). Higher returns require more risk, which in our view will not be rewarded in this type of environment. We suspect even the U.S. Treasury will be eventually challenged by this crisis. As we stated in January, we expect long term obligations of the U.S. Treasury to rise in yield. And while the Treasury can print money (which will lead to higher inflation in the long run, no doubt) other entities without the power of the printing press may not be able to raise cash to cover their interest payments. Remember the Panic of 1837 (that led to a 7 year depression) which we compared to our present times in May 2007? In the paper, The Depression of 1839 to 1843: States, Debts, and Banks, John Wallis notes that “Pennsylvania, Maryland, Indiana, Michigan, Illinois, Arkansas, Louisiana, Mississippi, and Florida all defaulted on their debt in 1841 and 1842.” Five of these ended up repudiating all or part of their debt.